‘Daikan’ meaning the large or harder ‘kan’, the coldest term of the year. Still, we feel that this is the last term to put up with the cold weather, feeling that we are about to turn the corner. Not everything is bad, in fact, the water on the morning of the very day of Daikan was believed to have least microbe or substances that would be the cause of decaying. Many sakeW manufacturers and those who regards water as important ingredients in their manufacturing still follow this belief and store water of this term of the year in tanks for their use. In Japanese classical military arts, such as Judo and Kendo, the custom as ‘Kan-geiko’, meaning training or practise in cold weather is implemented to train both the body and the mind. Finally, the coldest term of the year, ‘Daikan’ is about to end, another one season to go! The weather in Tokyo these few days have been rather pleasant for ‘Daikan’. We have been having days over 10 degrees Centigrade (50 degrees Fahrenheit) this week with sudden drop below 5 degrees Centigrade (41 degrees Fahrenheit) which leaves us with epidemic of flu. Still, it is joyous for us, the Japanese, to know that the cold winter is nearing the end. You would realise that there are many news broadcasted at the moment on something that reminds people of spring in Japan. 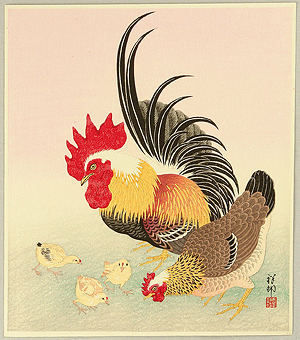 The last season’s phrase of Daikan is about ‘Niwatori’, the hen. ‘Niwatori’ has been a sacred bird in Japan since ancient times. It has been regarded sacred because fowls are birds that call on dawn. They were thought to be birds which tell us the borderline of the day and night, the time of divine and the time of human. This idea seems to have come from the ancient ‘sun worship’ which still exist as main God of ShintoW, ‘AmaterasuW. You can see that a fowl also took a part in opening the door of the cave when Amateraru hid herself in the myth about Japan enveloped in darkness. 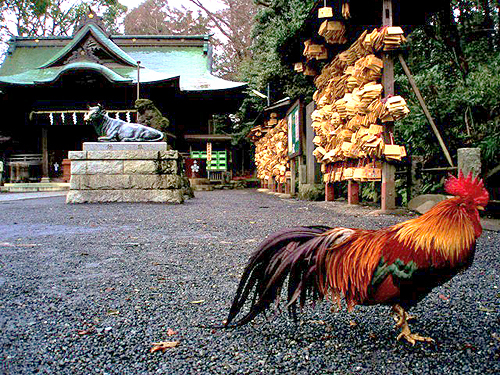 Some shrines in Japan still keep fowls as sacred birds in their site, most of them left loose. Fowl couple with chicks already hatched out of eggs. Going back to the phrase, the word ‘hajimete’, an adjectival equivalent meaning ‘for the first time’ comes, then the last verb, ‘nyusuru’ meaning ‘to lay eggs’ follows. The whole phrase says that the hen starts to lay eggs for the first time. A fowl kept loose in the shrine. Photo from ‘Damaken bukna center‘. You can see that the winter is about to end from two points, one, the hen and the other by the action of the hen, laying eggs, which expresses that the phrase has a strong stress on ‘the end’, giving us the idea that there is a specific borderline between spring and winter, life and death. Setsubun literally means a day before the ‘seasonal division’. Because there are four seasons, there used to be four Setsubun in a year. It was about from Muromachi periodW that Setsubun of ‘RisshunW’ became the only appointed ‘Setsubun’ to the public because the Setsubun was a day before Spring season’s start, a Winter season’s last day and a New Year’s (New Year in Luna calendar) eve which was the most important day of the year. The New Year’s Day was important for the Japanese not only because it was a new year’s start but because the evil was thought to be at its peak on the ‘seasonal division’, or the borderline day. To start the new year with full of luck throughout the year, getting rid of the strongest evil of winter was a must in the past. 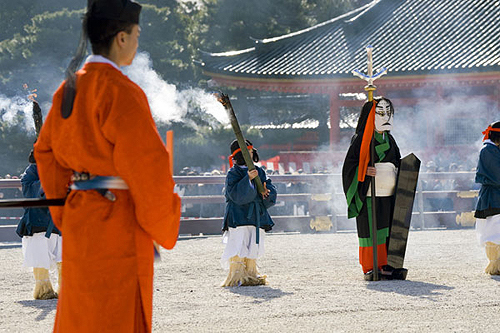 ‘Housoushi’ seen in black and green kimono with strange mask at ‘Tsuina’, the origin of Setsubun at Heian Jingu in Kyoto. Photo from ‘Blog:Noruma!!‘. The tradition of Setsubun was brought into Japan from China in Nara periodW. 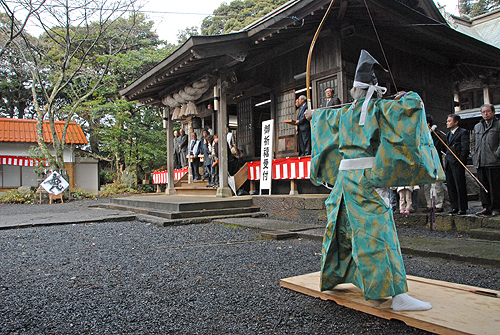 It was a ceremony of exorcising evil spirits by shooting a bow made from peach tree (peach was to purify evil) which became the annual functions observed at the Imperial Court in Heian periodW. The ceremony was called ‘Tsuina’, exorcising evil spirits by the court officer called ‘Housoushi’ and his assistants calling out spells around the Imperial Court. You can still see this Setsubun-origin ceremony as ‘Daina-no-gi’ on 3rd February in Heian JinguW as a part of the Setsubun festival. The Setsubun in the Court had several ceremonies, among them was the ceremony of ‘Mame-uchi’ or ‘Mame-maki’, meaning shooting or throwing the beans, which became the tradition which we still hold in our houses as well as in shrines and temples. The tradition became common in mid-Edo periodW with the meaning of exorcising the evil but also with the meaning of the harvest as the action of throwing the beans was like farmers sowing the seeds. Many shrines and temples hold the ceremony of Setsubun on 3rd February which differ according to the areas and districts. Some are really large with VIP and special guests like below. Many enjoy doing their ceremony at home. 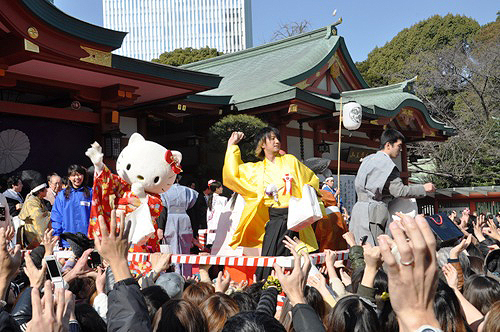 ‘Mame-maki’ at one of the shrines in Chiyoda ward, Tokyo, with famous Miss Kitty as a beans-throw performer. Photo from ‘Chiyoda City Tourism Association‘. The beans used in Setsubun for throwing must be roasted because the beans are for exorcising the evil and that the evil exorcised should not sprout from the beans used. 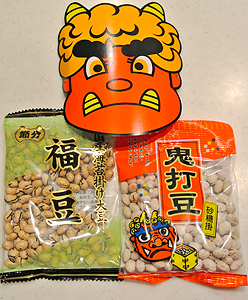 The roasted beans used at Setsubun is called ‘Fuku-mame’ (lucky beans) and are offered at the Shinto alter at home (if there is one) before throwing. It is said that the beans-throwing is more effective at night than in daytime because evils are thought to be active at 2 to 4 a.m. Beans are thrown out of the window with the call of “Oni ha soto!”, meaning ‘Out with the evils!’ then with call of “Fuku ha uchi!”, meaning ‘In with the luck!’, throwing the beans inside the house. Beans-throwing should be done from the room located in the rear of the building, windows and doors closed at once you finished throwing out and in the beans so that the evil won’t re-enter. The last place should be main entrance door. 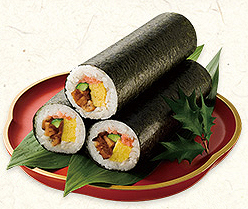 ‘Eho-maki’, rolled sushi sold at Seve Eleven Co. Ltd., one of the major convenience stores. Photo from ‘Seven Eleven Co.Ltd. Official Site‘. ‘Fuku-mame’ sold with paper mask of an evil at supermarkets. A must-item for Setsubun at home! Once the beans-throwing is finished, we are told to eat the beans in one added number of our own age (at some area the same number as one’s age), wishing the luck. Some areas use peanuts instead of beans. Eating rolled sushiW called ‘Eho-maki’, facing the lucky direction of the year is becoming nationwide tradition these days which first was a tradition of OsakaW, especially in merchant houses. You may see that there are posters and flags in supermarkets or convenience stores for this special sushi’s reservation. 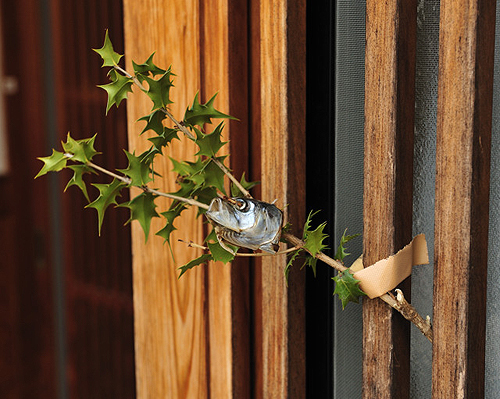 Roasted sardine head stuck on holly branch, a charm against evil spirits posted on entrance at Setsubun. Photo from ‘Kimamana kibun wo yuttarito‘. Special decoration can been seen at the entrance as the charm against evil spirits which is a branch of holly with roasted sardine head stuck on Setsubun. This charm is made from two things which evil hates which is placed at the entrance so that the evil won’t enter the house. A tradition in countryside or in old tradition areas.